A chemichal Lab + an explosion = Mutants! 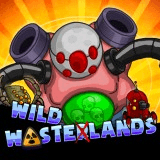 Guide the hero among hordes of mutant and robotical monsters to kill them all, face diferent bosses and upgrade your skills and weapons. And don’t forget your main task: Stay Alive!